World Book Day on 1 March 2018 is a great time to celebrate reading, sharing stories and favourite books. 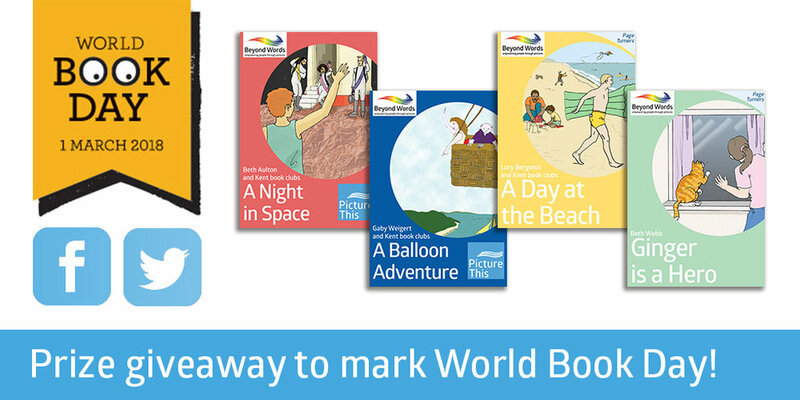 To mark World Book Day this year, we are giving away one complete set of our four Light Read books: A Day at the Beach, A Night in Space, A Balloon Adventure and Ginger is a Hero. To enter the prize draw please tell us on Facebook or Twitter which is your favourite Beyond Words book and why, using the hashtag #BeyondWordsFavourite. Don’t forget to tag us in your message or post it on our page so we see it! You can include a photo too if you’d like (we love seeing them), although you don’t need to include a photo to be entered into the draw. Entries must be received by 23:59 on 28 February 2018 to be entered into the draw. The winner will be drawn at random and contacted privately within a week of the closing date.